WASHINGTON -- Consumers shopping for new cars would be able to compare fuel economy and emissions levels with the U.S. fleet average by looking at labels on window stickers under a federal proposal made today. The Obama administration is carrying out a 2007 law that requires labels to put new vehicles in fleetwide context for fuel economy, greenhouse gases and smog-forming pollutants. The comparison must cover electric vehicles, plug-in hybrids and conventional gasoline and diesel vehicles. One part of the administration proposal would give each vehicle a bold letter grade from A+ to D for its fuel economy and greenhouse gases in comparison with the rest of the U.S. fleet. The auto industry opposes this approach while many environmental groups support it. 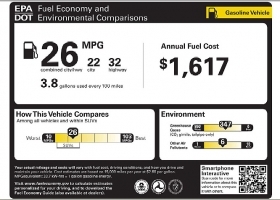 Current labels have just a mile-per-gallon figure for the vehicle without any pollution ratings. Comparisons also are limited to the class of vehicle rather than the entire U.S. fleet. An SUV, for example, is compared just to other SUVs. “We want to help buyers find vehicles that meet their needs, keep the air clean and save them money at the pump,” EPA Administrator Lisa Jackson said in a statement. The EPA and U.S. Department of Transportation said they want to have the new labels in place for as many 2012 model cars and trucks as possible. The proposed changes constitute the most significant overhaul of the fuel-economy label since its inception more than 30 years ago as automakers plan to introduce more fuel-efficient vehicles, the agencies said. The administration today also proposed different labels for advanced technology vehicles -- including plug-in hybrids and electric vehicles -- that are soon to be mass-marketed. These labels would contain additional information tailored to the technologies of the vehicles, the EPA said. For example, the label would identify how many miles the advanced technology vehicle can go before recharging or refueling. The administration is seeking public comment over the next 60 days before it adopts a final rule. The administration proposed two labeling approaches for vehicles. One approach would feature a letter grade. The label also would estimate the vehicle's fuel-cost savings over five years compared with the fleet average. The second proposal would keep the current label's focus on fuel economy and annual fuel-cost projections. Sliding-bar graphs underneath would compare the vehicle's fuel economy and tailpipe emissions with the fleet average. The auto-industry lobby opposes letter grades, while a number of environmental groups favor it. “Automakers support providing our customers with meaningful information for decision-making on vehicles that meet their particular needs, but the proposed letter grade falls short because it is imbued with school-yard memories of passing and failing,” said Dave McCurdy, CEO of the Auto Alliance. The lobby represents Toyota, General Motors, Ford and eight other domestic and foreign manufacturers. Under the grading system, 17 of the 2,011 models in the current fleet would receive an A or above, said Gina McCarthy, an EPA assistant administrator. Electric vehicles would get an A+, plug-in hybrids would get an A, and the “very best” hybrids -- such as Ford Fusions, the Honda Civic and the Toyota Prius -- would get an A-, she said. A total of 14 vehicles in the current fleet would receive a D or D+. These include high-performance vehicles such as a Ferrari 612, McCarthy said. The median grade would be a B-, she said. McCarthy said it is possible the final rule will contain a blend of the two proposed approaches. Environmental groups expressed dismay that the proposed labels would not factor in pollution caused by electric vehicles' use of power plants for recharging. This pollution is particularly acute in Midwestern and Eastern states, where generating facilities rely heavily on coal, environmental advocates said. “It misleads consumers about how polluting the vehicle is,” said Daniel Becker, director of the safe-climate campaign at the Center for Auto Safety. EPA said it intends to make this information available on the Web.